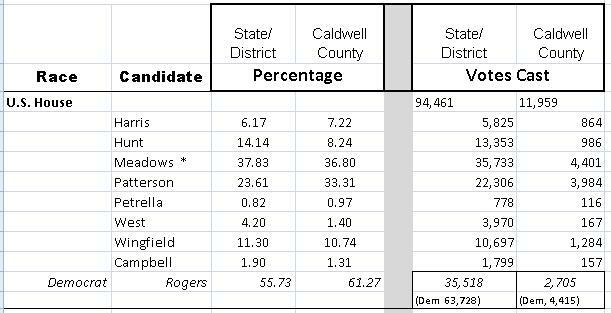 by CALDWELL COUNTY PRECINCT totals link. FOR YOU WONKS OUT THERE, HERE ARE THE RACE BY RACE DETAILS FOR EACH PRECINCT. HOW DID THE PRECINCT YOU WORKED DO? NC Democrat Party candidate information LINK. NC Family Policy Council questionnaire link for our Congressional candidates. Jobs plan outline (outside the scope of US Representative) http://www.vancenc.com/issues_01.html The plan will not be released until after he is elected. The only GOP candidate not to attend the 11th District GOP Convention on 4/14/12, instead he scheduled and paid for a TEA Party rally in Morganton and was the keynote speaker. He knowingly scheduled his TEA Party event at the same time as the convention, and then ridiculed the other candidates for being absent. huh? Q12. Should a person’s religious beliefs influence the decisions they make while serving in public office? NO – but in campaign speeches promises “God in government.” Was he careless and misread the question? Asked about this question at 5/22 meeting, he confirmed his answer of “no”. When asked about “God in government” and his statements of being a “Christian”, and “Student of the Bible”, he said he just didn’t like the question and explained religion should play no part in government. He would have been more comfortable with the question if it had been worded differently, like “Should a person’s faith influence the decisions….” Press Release from 5/25/12, link, that uses religious beliefs to make his point. Vance at Henderson County dinner, 3/25/12 – http://www.youtube.com/watch?feature=endscreen&NR=1&v=2IcJGZg5Jzw In the beginning, he promises to speak in specifics not platitudes. He touts a jobs plan. He “unveiled” a jobs plan 5/17/12, but it’s a short, 1-page outline that is more brief than what is already on his website about jobs. Where’s the plan? “Recommended” by Dr. Dan Eichenbaum, 5/1/12, for the May Primary. http://drdansfreedomforum.com/2012/05/primary-2012/ When asked in June, Dr. Dan is not taking a position on either candidate in the Run-off election. He is leaving the decision up to the voters. Endorsement from Jim GilChrist founder of Minuteman Project, 6/12/12. “Stands out as an advocate of border security,” said Gilchrist, 6/21/12. Vance did not attend TEA Party Express Bus Tour rally in Hendersonville on 6/9. iCaucus support withdrawn from Vance Patterson’s campaign, 6/18/12. Here. Additional iCaucus statement about details regarding statements made by the Patterson campaign about iCaucus, 6/22/12 – NC-11 statement. iCaucus interview with each of the four who were interviewed. http://www.icaucus.org/index.php?option=com_content&view=article&id=1189:nc-congressional-11th-district-candidates-2012&catid=188:north-carolina&Itemid=329 You will have to register first before you can listen. Grassroots NC endorsement – http://grnc.org/defend-your-rights/options/recent-grnc-updates/263-grnc-gun-rights-election-alert-us-house-district-11 GrassRoots NC is an active and very respected 2nd Amendment organization looked to by North Carolina TEA Parties for endorsements. NC Family Policy Council questionnaire link for our Congressional candidates. Mark’s answers. Mark Meadows in Marshall, NC, 4/21/12, “Poor Man’s Supper” 4 minute video – http://www.youtube.com/watch?v=G29nII2lzh4 This is the typical speech he gives with simple plan “life, liberty, and less government.” Explains his position and translates those positions into a congressional plan. Spoke to a big crowd at TEA Party Express Bus Tour stop in Hendersonville Saturday, 6/9. Endorsed by Kenny West, 2012 candidate for US House from Clay County. Endorsed by Asheville TEA Party PAC, 6/22/12. Press release. Rogers was Health Shuler’s Chief of Staff. * We are still in the 10th District with Rep. Patrick McHenry representing us, but we will be voting in the 11th District Primary in May 2012. So we begin now getting to know all of these candidates. Share this information with your friends and family. Part 4 –(Meadows and Patterson)—-> video missing? iCaucus endorsed on 3/28/12. iCaucus member link. Ljnk. Endorsed by We The People of NC PAC, 5/20/12. Endorsed by Mike Huckabee’s HuckPAC, 7/12/12. link. AJ Daoud, candidate for Secretary of State, endorses Goodwin. Endorsed by Conservatives for Guilford County (C4GC), 6/21/12, link. Did not return the completed Caldwell TEA Party Voter Guide survey. Received 2008 NC Sierra Club endorsement for his positions on the environment. See link at end of District 4 write up. See “Endorsements” list for Gardner link. Endorsed my James McCall another GOP candidate who race for this seat. link. Morgan (R) was co-Speaker with Jim Black (D). “After nearly a week of negotiations, Republicans and Democrats agreed to a historic co-speakership between Black and Rep. Richard Morgan” http://projects.newsobserver.com/dome/profiles/jim_black An exhaustive article. Tedesco commercial http://www.youtube.com/watch?v=JVrxs4h6I4c I understand now what John is talking about here. John realizes that it is not the job of NC Superintendent’s job to rid the country of the federal Department of Education – that is the job of Congress. While abolishing the Dept of Education in DC plays well with conservative voters everywhere, John’s promise to be the all-important FIREWALL against the feds is a very appropriate goal. iCaucus interview – http://www.icaucus.org/index.php?option=com_content&view=article&id=1278:tedesco-john-candidate-nc-state-superintendent-of-instruction&catid=188:north-carolina&Itemid=329 You will have to register first, then you can listen. 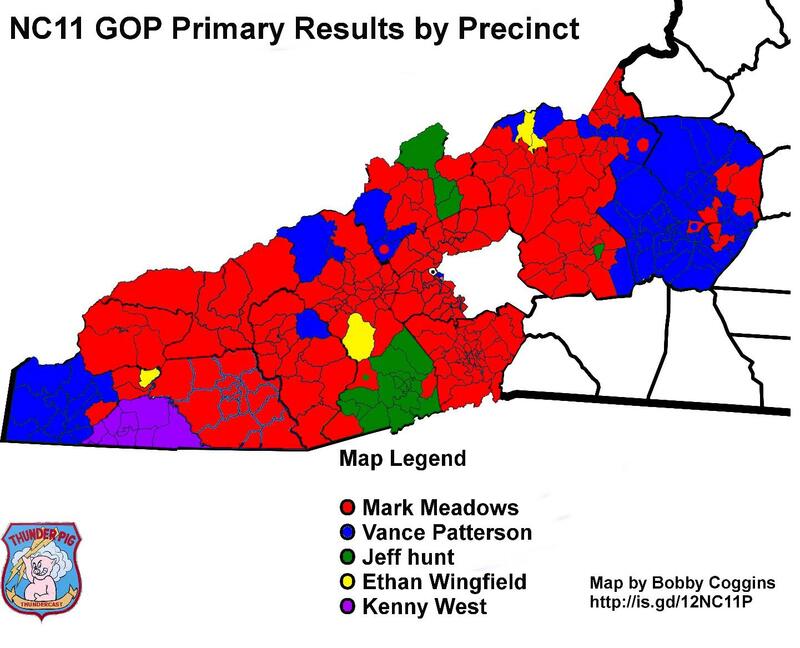 May 2012 RESULTS – MORE LENGTHY comparison between statewide and Caldwell County voting. Includes Democrat totals in a 4 races. May 2012 Results – short, quick comparison between statewide and Caldwell County vote. Civitas ranks Soucek as #2 most conservative in NC Senate with 97.7% rating. Endorsed by GrassrootsNC, 4/26/12. GRNC is a 2nd Amendment organization in NC that thoroughly vets candidates on their positions to protect our gun rights. Soucek scored a 100% for his record in the Legislature. Quote from his home page, his Democracy For America values, “Roy Carter is socially progressive because he has always held to the Democratic values of equality and civil liberties.” Those words “socially progressive” set off alarms for patriots. At a Caldwell County Democrat Party meeting that I attended, he admitted for the first time he is against Defense of Marriage Amendment (DOMA). He does not support traditional marriage. He said something like, I hope that doesn’t get out. Ran for county commission as a Democrat in 2008, was a Republican from 2002-2004, then a Dem from 2004-2011. Before 2002, he was a lifelong Democrat. It’s one thing to have a change of heart like Ronald Reagan or Jessie Helms did, but it’s something different to ping-pong back and forth between the two parties for 10 years.